This model by Unique Replicas in 1:24 scale comes with a raw wood coffin with 2 simple A rests, flower wreath and an easel to hold it. The hood, doors and split rear doors open. 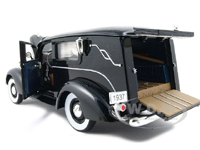 This and similar Studebaker hearses in different scales and with other detail variations can often be found on eBay . The model shown (with darker wood items) can be purchased HERE at $64.99.